Tomato, Onion And Cheese Omelet recipe by Nazia Nazar at PakiRecipes.com. 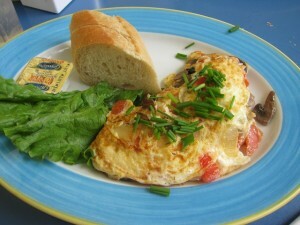 The delicious Cheesy Tomato and Onion Omelette. A Juicy breakfast dish consists of eggs, cheese, onions and tomatoes. Combine eggs, 2 tablespoons chopped fresh coriander and salt and pepper to taste. Beat until well blended. Stir in tomato and onion . In a medium non stick frying pan, heat 1 tablespoons butter; over moderately high heat, until butter melts and foam begins to subside. Add half of egg mixture. Cook until omelet is set, tilting pan and lifting edge of omellet with spatula to let uncooked portion flow underneath, about 2 minutes. Top with 1/4 cup grated cheese. Fold omellet into thirds and turn out onto plate. Repeat with remaining 1 tablespoons butter, egg mixture and 1/4 cup grated cheese. Sprinkle omellets with additional chopped fresh parsley.